Why is staining and sealing wood important? 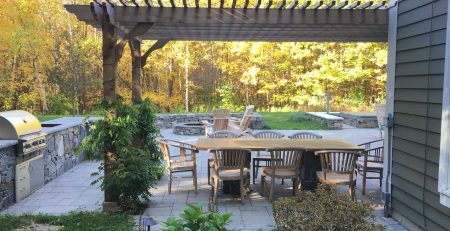 When should you stain or seal a wood pergola? What types of products are best for staining and sealing wood? What are the steps for staining and sealing a wood pergola? Which colors look best on a pergola? 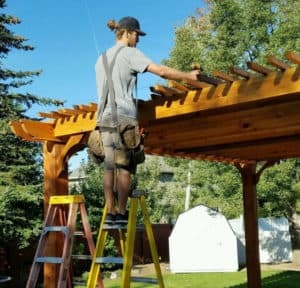 Before we dive into staining and sealing wood pergolas, an important point to mention up front about the timing of when to stain pine vs cedar pergolas: If you have a pressure treated pine pergola, you must wait until the pressure treatment is completely dry before it will accept stain or paint. This can be anywhere from 2-6 months after you assemble the pergola, depending on your local climate. The wood will likely be wet when you receive the pergola kit, and it will not accept stain or paint when it is wet. If you have a rough sawn western red cedar pergola, it will accept stain or paint right away. 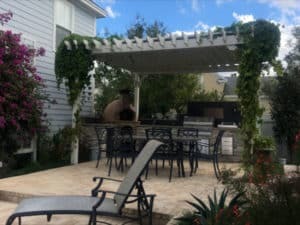 It’ll be a personal preference whether you choose to stain, seal or paint your pergola, and maybe this article will point you in the direction that suits your desired look, and aligns with the weather in your location. With sturdy rot-resistant wood like pressure-treated pine and cedar, you can choose whether or not to add stain or sealant, but either type is best preserved by staining or sealing. Without it, the wood will naturally turn to gray over time and will be more exposed to the elements. For maintaining outdoor wood pergola structures in certain climates or simply a personal color preference for the appearance of the structure, you may want to consider staining and sealing the wood. Stain and sealant adds a layer of protection to the wood, protecting it from UV rays, moisture and temperature changes, and helps maintain the wood’s color. Consider your climate, what type of wood, and the primary use of your outdoor space. Then you can make your plan for staining or sealing your pergola, starting with color choice and the best time to get started. If you’re opting to paint or stain your pergola, at some point you’ll be standing in that colorful aisle at your local home improvement store, staring at the wide variety of finishes available. 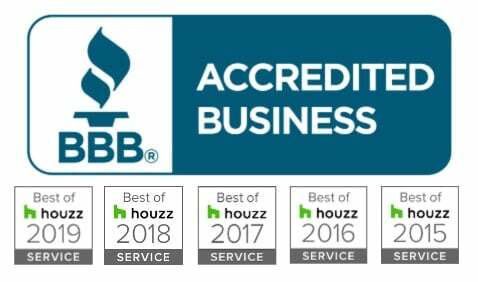 Ask an expert in exterior wood stain to help you with your selection. We recommend seeking advice from the paint & stain specialists when choosing your stain or paint, and follow safety and application instructions carefully. If you’re going for a more natural look, choose a clear or very light color stain with a light tint for UV rays. 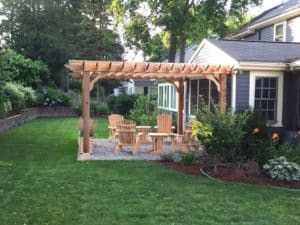 Here’s an example of a pergola that offers a beautiful contrast with the grey siding of the house and has a wood stain that matches the deck. Stains and sealants are available in many different brands, so if you don’t have a preferred brand, ask at your local paint and stain store or hardware store for recommendations that will work best for your application. When considering your stain options, a general rule of thumb is the more transparent the stain is, the more of the natural wood grain you’ll see. The more opaque (non-transparent) the stain is, the less of the natural wood grain you’ll see. The 3 main types of stains are Clear, Semi-Transparent, and Solid with a variety of in between ranges depending on the brand product you choose. A clear stain with a light tint for protection from ultraviolet rays is a common choice. There are stain and sealer combinations that work well and apply with one step if you want to keep the natural wood look with some protection. Re-application timeframes also vary based on the brand and your local climate, but typically re-application is recommended every couple years. Choosing to paint your pergola is a matter of preference and desired design for your outdoor retreat. Oftentimes the natural color of the wood is the best choice to achieve a look that blends in with your existing patio. 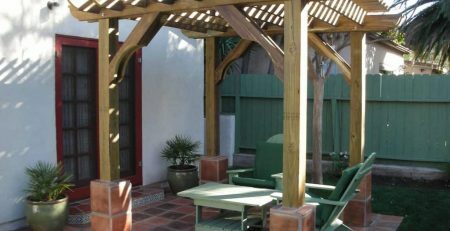 There are also pergola paint colors that can add a certain design element you might find attractive for your backyard. 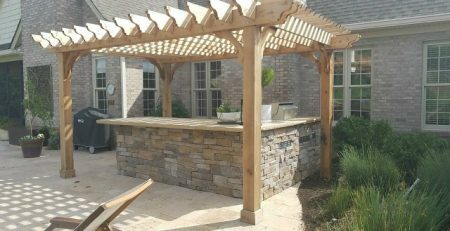 This pergola is a very appealing gray that matches the stone pavers and furniture selections on the outdoor patio. 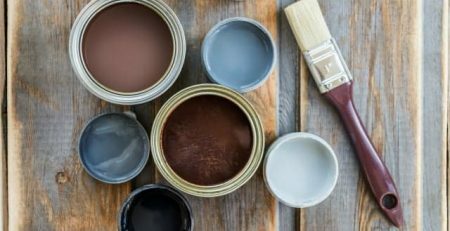 We recommend seeking advice from the paint & stain experts when choosing your paint or stain, and follow safety and application instructions carefully. 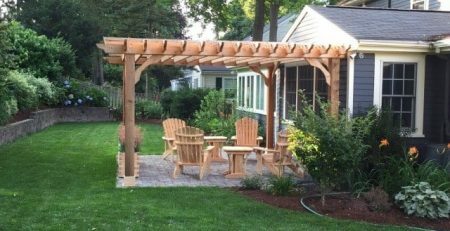 Once you’ve got your paint, stain, or sealant chosen, you’re ready to get started on your wood pergola! If you opt for adding a sealant or stain to your wood pergola, follow a couple guidelines for when to stain or seal. For pressure-treated wood, you must wait until the wood is completely dry before adding stain, sealant, or paint. This can be 2-6 months after you assemble the pergola, depending on your local weather. Pressure-treated pine will initially have a green appearance, that over a couple months’ time will turn to a golden brown, then gray if not water sealed or stained. A golden brown color is the indicator that it’s ready to stain or seal. Depending on the product you choose, follow the instructions on the can carefully, just as you would for applying finishes to other exterior wood surfaces. For rough sawn western red cedar, you can add stain or sealant right away if desired. This type of cedar has a light amber color, and takes stains very well. 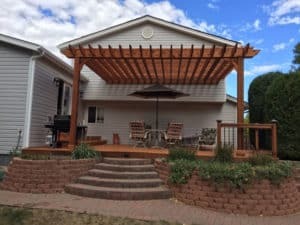 How often should I stain or seal my pergola? 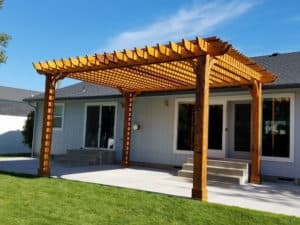 If you’ve opted to stain or seal your pergola, the frequency of re-staining and re-sealing your pergola depends on your climate and the type of stain or sealant you choose. Timeframes range from every year to every 2-3 years. What weather conditions are best for staining and sealing wood? 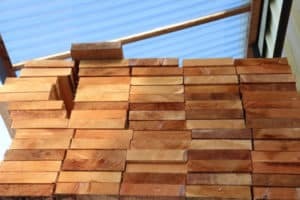 A general rule of thumb for the best type of weather and temperature for staining and sealing wood is between 50 and 80 degrees Fahrenheit (between 10 and 27 degrees Celsius). Deciding when to stain should be based on your extended forecast. The wood needs to be dry when you apply the stain or sealant, and a precipitation-free window of time after staining. Most types of stain recommend a rain-free window of around 24-48 hours after application. Follow the application guidelines on your chosen stain, sealant or paint. Here are the main steps and tips for staining and sealing your outdoor pergola. After you’ve double-checked that you’ll have a 24-48 hour period after you stain that you’ll be precipitation-free (depending on the product you’re applying), you can get started. First, prep your pergola so it’s ready to accept the stain or sealant. Make sure it’s clear of surface dirt and is completely dry before applying any stain, sealant, or paint. Brush off any surface dirt with a cloth or soft brush. If you lightly hose off any part of the wood, make sure to let the wood dry completely before starting. Get your preferred supplies set out and ready to go, including cleaning rags, stain or paint, brushes, safety goggles, drop cloths (if you have a patio surface or furniture to protect), and step ladder. Retract or remove any accessories from the pergola or use extra caution around those areas so the stain or paint doesn’t drip. Cover any furniture, outdoor kitchens, or patio surfaces with drop cloths. Work from top to bottom and apply your paint, sealant, or stain according to the instructions on your chosen product. 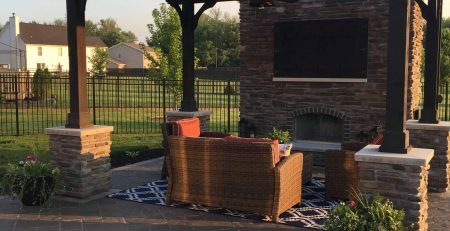 With these few easy steps, you can extend the enjoyment of your backyard by maintaining your outdoor structures. Wood pergolas are a wonderful feature that adds beauty to your garden and outdoor living space. 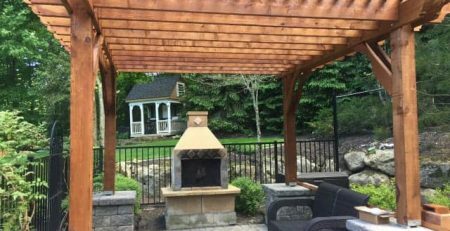 Sealing or staining your wood pergola can enhance the enjoyment you’ll get and maintain the natural beauty of one of your most prized patio possessions for many years.